Speaking of leftover bikes, here’s a purchase that followed not too long after I picked up my 1988 Honda Hawk GT. Yet again, we’re going even further back into the years. Now do you believe me when I wrote that I was going “backwards” in my motorcycle ownership? But with this, it was one of those love-at-first-sight purchases that I had with this bike. Unlike my 88 Hawk GT, I didn't even need a first ride. 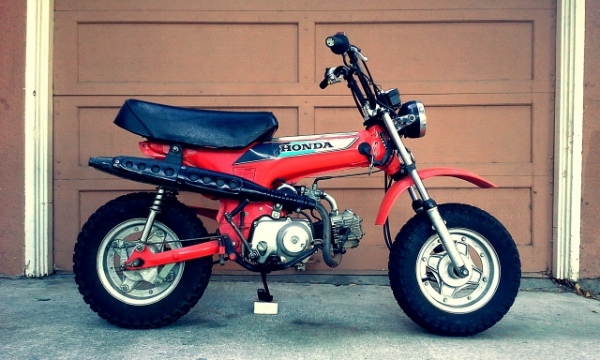 I’m far from a CT70 enthusiast since I didn't actually know about this bike until the morning I first found one listed in Craigslist when I searched for “pit bikes” to use during the trackday events that I worked. 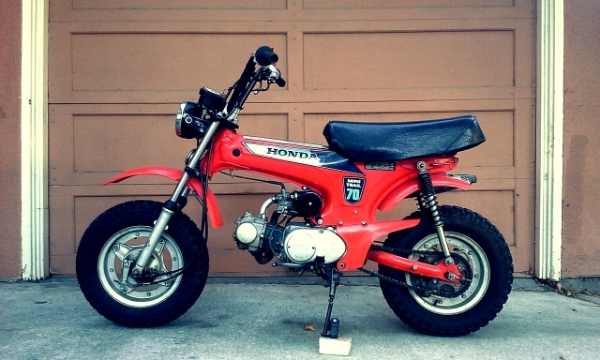 When I saw a photo of the bike in a for sale ad, I think it was the pressed-steel “T-bone“ frame that caught my eye in how much different the bike was to all other minibikes or scooters. I just knew the CT70 was the bike I wanted to have as my pit bike. Problem was while these bikes regularly popped up in Craigslist, there were two kinds of them to be found – those that were priced very well and so were sold very quickly, and those that were priced as collector’s items. The latter tend to be either mint-condition models, or faithfully and impeccably restored. Typically, models in good running condition can be found anywhere between $500 and $1000. If currently registered for street-legal use, the price range jumps up between $1000 and $1500, but those in mint or impeccably restored condition, AND street legal? Dead serious – I've seen them listed for over $3000, even one around $4000 occasionally. I just wanted one for a pit bike, so I actually waited to find one for the right price. Good running ones would pop up with reasonable prices, but as I've said, they were nabbed well before I can get to them. Eventually, I found one listed for $500, but it wasn't running and there was no paperwork. The seller apparently got it as part of a compensation for contracting services he provided to the previous owner. I would've paid $500 for the bike, but gave it a shot and said that I didn't think it worth more than $300 as a non-runner with no paperwork or plate, which meant the chances of it being street legal were nil. The latter wasn't really an issue for me since the bike would only be used in private properties (track paddocks), but it didn't hurt to bluff. The bluff didn't hurt; the seller took my $300, and I had my CT70 pit bike. After shelling out another $80 for a new fuel tank (the old one was in a perpetual state of rusting inside, clogging the carbs) and having the carbs cleaned, the bike has been in use ever since. I’ll admit, it’s a shame that the bike did not have a license plate or any paperwork that could help me get it street-legal with DMV, because I could otherwise be using the bike to scoot around my town and be thoroughly enjoying doing so. Even some of my family and friends who otherwise don’t ride motorcycles can’t help but want to get on it (the 3-speed semi-automatic transmission makes it easy for anyone! ), and hop off with a big grin from a quick round-about jaunt. Even my daughter won’t miss an opportunity to hitch a ride with me whenever I kickstart the bike up. This is a bite-size motorcycle with full-size riding satisfaction. I actually keep this bike in my backyard shed, to keep it away from my revolving-door-of-motorcycles in the garage. Because this little bike right here, it's a keeper.